I really love the app. But if you accidentally close the app before you press ok. The comic you purchased could now be frozen. And you’ll have to delete the app, and then get the app again. Only then will you have the comic you purchased, but now you’ll have to download every comic you’ve previously bought, again. Thankfully, this has only happened once. I like getting the digital copies of the comics I buy in print and reading them a second time on the app. My only recommendation for improvement would be to make a feature to redeem digital copies IN THE APP instead of having to go to the website to redeem the digital copies. Love this app and will continue to use it for years to come! It won’t take my password anymore, when I go to retrieve it then it says my email doesn’t have an account, then when I try to “create” an account it says that email already has one because I do. And there’s no way to contact anybody for help. I am willing to update my rating once I figure out how the hell to close a book. I have tried all manner of swiping, tapping, and holding. I’ve even closed the app, reopened it and it was still in the book. How the hell do close a book (without having to scroll all the way to the last page of the book. Surely that’s not the only way to close the book)?!?! I saw the smart control pop up and I STILL can’t figure out how to enable the smart controls. Might be a good app if it wasn’t so hard to control. I’m having a tough time scrolling thru my collection and I can’t even get thru the first dozen titles I have. How do I fix this issue on my iPad Air 2? I love this app. I fought like an idiot against reading digital comics on my phone, this will never ever take the place of holding and smelling an actual comic but it’s waaaaay better than I expected. I bought an 80’s Fantastic Four trade spotlighting John Byrne and was blown away. First it shows the full page, swipe and it zooms in on a single panel and then swipe from panel to panel. The digital re-colors didn’t bother me at all, in fact the panels look awesome. Perfect for time killing, I’d much rather read an old FF than mindless scrolling on IG or FB or some news app. Prices are not too bad 1.99 for a single issue 14.99 for a ten issue trade. I’m a thousand percent stoked I gave this app a try!!! I love that marvel gives you free didital downloads with every real paper comic you buy. Makes it easy to read anywhere especially in bed. 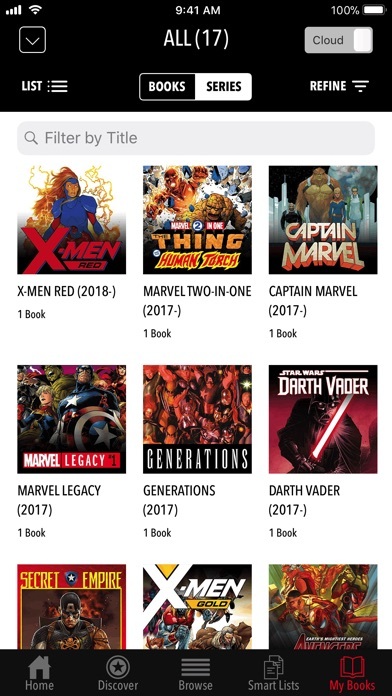 I love this app, I have purchased easily over 100 comics on this app but the recent update makes all of the series blocks smaller and sets it to default in your library for your new comics to show up first out of chronological order from issue #1 showing up first in your library. Please change this back. Thank you. I try to logging but every time I logging it keeps saying you have a Wong account. please fix this bug so me and the others can login without having to worry about the bug problem. I Love the app I have a more then 100 comics. It Would be nice if there was a search by character option like if I type Thanos it would pull up all the comics with Thanos in them. If you would add that feature it would be AMAZING!!!. I purchased two digital comics and it was very frustrating to try to read them on my iPad. The app crashed, wouldn’t turn pages, and it was extremely difficult to open the comics at all! I eventually gave up and read them on my desktop. Shame on you Marvel. This should be as easy as iBooks. I will not be purchasing any more digital comics. The app is easy to use and I am glad it has in app purchases. The only downside is it doesn’t have the max imprints. Really enjoy this app and having my marvel comic collection digitally enables me to read just about anywhere. 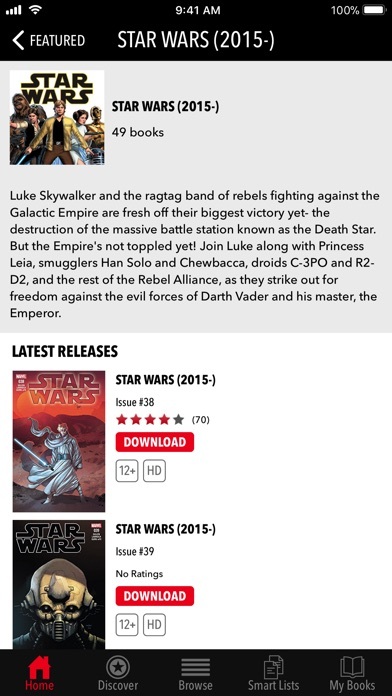 The app has lots of nice options for viewing the comics. I really like how it can zoom into the section of the page to enable easy reading. Having the digital store also allows me to read some past/present comics I would not normally buy in a paper copy. I also find it useful for tracking what I have or have not read. It is also great for jumping to another issue to get a quick refresher on a back story. My collection is easily approaching 500 comics digitally and I am noticing greater lag time to view your collection. Also, there is no redeem feature built into the app for redeeming your digital copy of your physical comic. Lastly, a few of the older comics are not as crisp or clean digital transfers with some art and text a little fuzzy or difficult to read. Overall, highly recommend for comic fans young and old. This is a rip off you can get unlimited comic from another app for $9.99 way less then this junk. It never fails to crash when I hit view all no matter the list! I live this app but why does it continuously crashes ever time I press the “See All” tab?? This app does it as well as the DC Comic app. same apps and crashes while doing the Same thing. Please fix it .. This will launch adds in your YouTube and other videos before they start. Total BS. The greed is never enough. It overrides your pop up blockers. Super sneaky app. Completely uninstalled. Anti American. 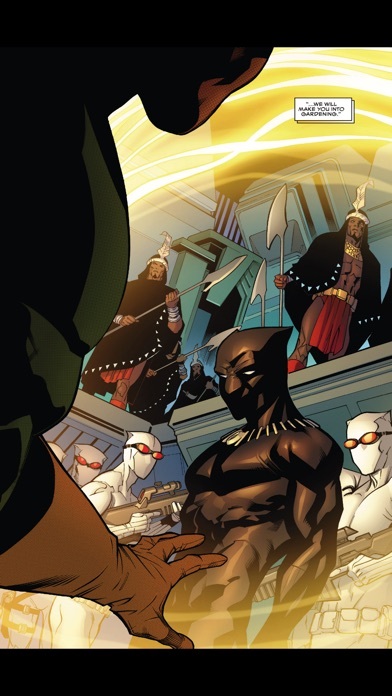 Will never support Marvel or Black Panthers. This is SICK! No search? Are you insane? Either there’s no search function, or someone tried REALLY HARD to hide the search function. Either way, what were you thinking? PSA - STICK WITH PAPER COMICS!!! I’ve had this app for years. My paper collection was building and taking up a lot of space so I thought it would be a good idea to go digital. BAD IDEA! Regrettably, I have well over 800 comics on this app. The app crashes and I’ve repeatedly lost access to my library. On multiple occasions my library size has suddenly shrunk to a fraction of what what it truly is which leaves me to jump through a series of hoops to regain access. The new update has you going through a series of interactive security checks to ensure that you aren’t a “robot.” This is ridiculous to have to go through for a member. This isn’t Fort Knox! I am a huge Marvel fan across all spectrums. However, if I had it to do over again I would have stuck with paper comics. When the app is working it is great. The organization is nice and has helped me keep track of my comics very well. The two main issues I have is there is no way to redeem digital codes through the app so you have to constantly go back and forth to the website and also that it constantly logs you out. This wouldn’t be a very big problem if it weren’t for the fact that you have to jump through a ton of hoops to get logged back in. Why do I have to solve 5 captchas to sign in? I love the app, but they randomly got rid of the wishlist system which 1: make the smart list system completely useless 2: deletes every single comic you’ve wish-listed, and I had close to a hundred comics that I wish listed Please bring it back, PLEASE! In latest version, the books filter limits All to 50. I have hundreds of books, so now I can’t access them. Very wrong filter. Needs to be fixed. Worked fine until latest version; logs me out each time I relaunch the app. The currently few updates have me signing into the application every day. Please fix this immediately. This app is unusable. Doesn't open comics or if it does it crashes incessantly which is a shame for such a large company. Please fix it and I'll update this review. I want to like it. Until it's fixed I have to warn people away. This app DOES NOT WORK. Save your money and time. Update doesn’t work, app keeps logging me out and the I’m not a robot system you guys use is horrible. Honestly the whole experience is so aggressively unfriendly that it makes me want to give up on it. The currently few updates have me signing into the application every day. The app constantly logs me out on its own and tells me that I have no comics downloaded. I have to go through more crap to log back in than I do for my bank’s app! It took me through 5 screens of pictures to verify that I’m not a robot. Who cares if I am! Hey Marvel/Disney, you’re not the government (accessing my my license branch info is easier than logging back in to this app)!!! This is a great app but the newest update has made it unusable. You need a new login (I previously used my Amazon login) and the captcha is ridiculously long. It makes you do the picture selection thing like four times every login and you have to log in new every time. Combine that with the re-tries when you can’t remember your new login info and it made me give up on trying to use it. 3.11.4 update: Still getting logged out despite it being listed as fixed in this version. Hey Marvel if you're listening...please hire some app developers that are smart enough to test their releases before deploying. I think you'll find sales are more consistent when you do. THIS IS GARBAGE. WHAT THE HELL? The best app for reading comics period!!! I use this app everyday and the prices are amazing. Get it now you fools! It's a great app. I love reading while I'm out and about or waiting in a lobby or car wash. It's super convenient. Nuff said! I love Marvel comics. It's the best comic book ever. The Guided view is essential for enjoying on a small sized screen. Well done The search feature for the store isn't great. I can read all my comics and keep inventory of what comics I have and which ones I need! It's really helpful and I finally know what's happening in the marvel universe! This is so good to read comics without having to carry them around!! It is wonderful to have many of my comics available to read on my phone. This marvel app is great. Fantastic to read comics on. Highly recommended! It's a great app, though I wish there was a way to redeem digital codes in it. The app is great and keeps getting better, I'm glad they've got the classics being added, it's the future of comics, who has the space for the physical books, plus they've gotten so expensive, the app solves both problems! Awesome app, easy to use and have your entire library at your fingertips. Considering I apparently can't create an account and the customer service is garbage could you please add a Facebook log in on the app. It's on the website, but not the app... ok. This app has every Marvel comic I would ever want to read. A good app. Many good stories have I read from this app. It's practically perfect. Every Wednesday I'm on this app before and after work with instant access to the latest comics. I don't live close enough to any comic book shops, but I love Marvel. This app & Marvel Unlimited are how I get all of my comics. I don't know how Marvel counts digital sales. I want my favorite characters & story lines to do well. This is the easiest way for me to support my comics. 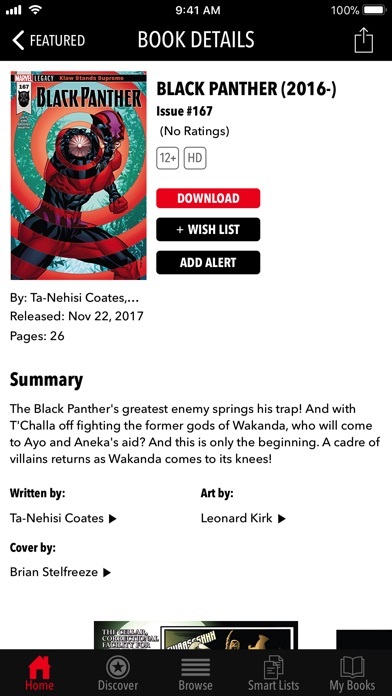 I buy story lines I care about & rent every thing else (via Marvel Unlimited). While I'm here someone tell Marvel they need to bring Emma Frost back as a main character. It's been super fun and easy to use. I love good stories and good art. Marvel gives me both. The security was so excessive and glitchy just setting up an account was a headache. The keyboard kept retracting for no apparent reason. Once I got in, the prices for digital copies of classic titles seemed excessive to me, so I deleted the app of my tablet, without reading a single title. DO NOT INSTALL!!!! The reCAPTCHA does not work and spins endlessly. Why there is a reCAPTCHA is beyond me... Upgraded and not app does not work and won't let me log in. Last update forces login with annoying reCAPTCHA images every single use now. I will stop purchasing new comics until this gets fixed. Keep getting kicked out and having to log in with annoying captcha. This app was all time favorite of mine but lately It keeps signing me out again and again and again. I cannot even re-sign in bc of gods knows what. This app has logged me out at least once a day for the past week or so. It’s ridiculous. When I attempt to log back in, after an obnoxiously long CAPTCHA mind you, sometimes it still won’t log me in. Fix this please!! Worked fine until latest version; logs me out each time I relaunch the app, and I have to keep spending a few minutes going through login/captcha just to read my books. Love this app but have to give it one star (for now) as the iPad Pro 2018 (11 inches) isn’t supported (unlike the recently updated ComiXology, DC and Image apps). Will update the rating in case this changes. Really nothing about Stan on front page after two days? Really? Add digital code support in app!!! I’m really tired of typing in all of my digital codes in on a web browser from my physical comics. The website once in a while doesn’t load right and then makes your code “already used” and won’t give you the comic. Why is there no option in this app that lets you type in the code? Why does it have to be on a website? There should even be a reader that scans the code automatically by your camera. There's an issue with my copy of daredevil Vol 1. Other than that I've never had problems. It's great if you want to buy books in the app. It's terrible otherwise. Redeeming codes is near impossible!!!! They never work, and when they do they are for the wrong book. On top of that it takes forever to get a response from Marvel and when they do they give you the wrong code. Make Mine Marvel! Always and Forever a true believer!!! This application is one of the main reasons I still read Marvel Comics. The interface is great and I always have something to read while I'm on the go. The ability to redeem codes that you get in other comics that you purchase is invaluable. Are use this app very often and I highly recommend it for anybody who is a fan of comics. Just love it. I'm only disappointed that buying the real copies no longer confers a digital copy of the same comic. They changed that policy a while ago, providing digital comics from other series instead. Create acct w facebook so desnt work??? Marvels lets u sign up using FB then demands a password to use app but can’t using FB??? So marvel purgatory i guess? I always have to sign in. Passwords and user ID never get stored. Can’t see let alone buy the new comics for some reason some weeks like this one. Send feedback doesn’t allow you to send because the button is covered by the keyboard which there doesn’t seem to be a way to move to click the it. Pain in the rear all around, not intuitive, directs user to books they aren’t looking for. Overall I like the app. However this version freezes every so often on iPad Air 2. Hopefully this gets resolved soon. Does not fit on new iPads. Page turning, like all Comixology apps is awful. Library management is a joke. And they want $4 a comic for this garbage. Fix these apps already Amazon. The point of digital is to be better than physical. Stop being lazy just because you hold a monopoly. Don’t waste money collecting comics in these Comixology apps, the experience isn’t worth the high cost. It’s easier to just pirate the comics for free and use third party apps designed by comic book enthusiasts that are aware of what the readers actually want. I am so incredibly tired of the app crashing and signing me out. Anytime I try to read comics on the app, I am forced to fight the log in interface and redownload all my comics. After all the time and money I’ve committed to Marvel comics, I am so very hurt and disappointed that Marvel cannot manage to make their digital comic app work. 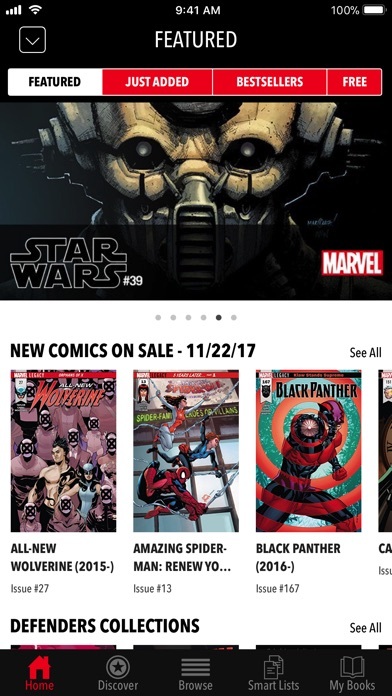 App makes you sign in to marvel insider multiple times a week. Also whenever I make a purchase it tell me I already purchased comic and it will be downloaded for free. All I wanted to do was read some marvel comics but I found out that about 90% of these comics you need to buy to read. Don’t choose this because it is money hungry. Every time the app restarts I have to log in again. Again. Had this app for years, this stupid thing asked me to change my password, so I did and my Comics DISAPPEARED! I’ve emailed the help desk 3 times in a week and still NOTHING!!! All that money down the drain! app crashed in the midst of a book purchase now the purchase button is grayed out and won’t let me purchase. and what’s up with the alert option? i never get an alert for anything, what’s the point? still great app tho. I like the way it follows the story in the comic when going to each section. Also nice to have an option to see full page or closeup on each section. I just started reading comics a few weeks ago and I made my way to Cataclysm. I digitally collected the series but it wasn’t until about 9 issues in when I realized the comics are not presented in reading order. There’s no current way to change this, I just have to scroll through the whole collection to find the right comic. Every time I close the app it logs me out of my account. Please fix the bug. Still needs some work but not bad. I have had this app for a while, maybe for about a few years, and there is still always something wrong with the app. It’s nothing major, just little occurrences that are really annoying. For example, each time I click “see all” for the new comics on sale for the week, the app always crashes. The app has crashed a few times just trying to sign into my account. Other than that, it’s not a bad app. On another note, I wish that the app would allow you to see what new comics are coming out next week, not just the week that you are in.